Most of the time, I think Amazon are really clever. If I have a look at the top 15 items they’re currently recommending I buy, they list five items I already own, six I’d really like, and just four I have little or no interest in. This is a pretty good strike-rate. Sometimes, however, I think Amazon are really, really stupid. We’ve noticed that customers who have expressed interest in “Sensuous [Australian Import]” by Cornelius have also ordered “Cornelius” by Sensuous. For this reason, you might like to know that “Cornelius” will be released on 2 April 2007. You can pre-order your copy for just Â£11.99 by following the link below. I have decided: my new ambition is to put on as much weight as I possibly can, to the point where fat suffocates my limping heart and I can no longer raise myself from the sheets without bedsores tearing flesh from my swollen, useless torso. They’ll need a crane to cart me off to hospital, I tell you. 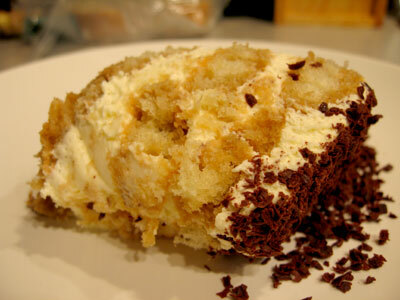 And so, to start, I made some yummy turamisu. Tomorrow, if you’re really lucky, I’ll post a picture of my 70s-stylee black forest gateaux. It contains approximately 9000 calories. “Put down that rawhide bone, drop that ball of yarn”, it’s the Petcast, recorded every weekend in Las Vegas and broadcast to a theoretical audience of millions world-wide. This week’s guest was, you guessed it, me. I was interviewed for the show via the magic of Skype, and talk about Cats In Sinks, Kittenwar, The Daily Kitten and the Random Kitten Generator. Oh, and North Korea. I’m not comfortable doing this kind of thing and hate the sound of my own voice, but I figure I had better get used to it as the massive publicity machine surrounding the launch of the Kittenwar range of products ramps up. Or something. Anyway, it wasn’t too bad. The hosts referred to me as Frasier rather than Fraser throughout the show, but nearly all Americans do that, so they’re forgiven, and I don’t come across as being as cat-mental as I thought I might. Well, maybe a little. Direct link to audio – I come on at the ten minute mark. Having spent the last hour attempting to buy a pair of tickets for the forthcoming England Under-21 game, it is gratifying to learn that the rank incompetence which has characterised much of the stadium’s construction has been extended to the ticketing process. Initially I was placed in a queue to buy tickets on the website. Shortly afterwards, the page refreshed to reveal that I was 200 places lower in the queue. The next refresh threw me out of the this process altogether. Since then, I’ve been greeted by a series of different error messages. Meanwhile, attempting to book tickets by phone has resulted in a similar number of variables: a recorded box office message, a recorded message from BT, and a simple engaged tone. I expect this story will be spun to reflect your surprise at the huge number of eager fans ready to show their enthusiasm for England’s return to their traditional home, as if this technological failure actually represents some kind of triumph. In reality, of course, it merely confirms the disdain you display for those willing to put money in your pockets, your continued refusal to come to grips with 21st century technology (it’s a website: you can prepare for these spikes in traffic. You can simulate your server being hit by tens of thousands of simultaneous connections. It *really* isn’t rocket science), and the rampant ineptitude you’ve publicly demonstrated again and again and again ever since the Wembley project was first mooted. Update: Three hours later, through some minor URL hackery (making note of my session id and refreshing the page with the correct variable each time the errors appeared), I made it to the front of the queue, entered my fan number and password, clicked submit, and… after being greeted by another series of runtime errors, was finally told that my ticketing session had expired. Back to the start of the queue. I went to a peculiar thing on Friday night, a ‘blogger’s screening’ of the new Danny Boyle film Sunshine. Why peculiar? Well, before the movie started, a representative of 20th Centrury Fox stood up and told us that while we were a) encouraged to write about the film, we were b) under no circumstances to actually review it. So it’s with this ambiguity ringing in my ears that I write this post. And instead of bringing you prose pertaining to plot-line and performance, I’ve decided to exclusively reveal the top five things I learnt during the film. 1. It’s actually possible to get much closer to the sun than scientists have previously thought. In fact, it’s possible to get really close without suffering from much more than a extreme case of eczema and a desperate need for anger management therapy. 2. Seats at the preview theatre in Soho Square are much more comfortable than those at normal, proletariat cinemas. 3. The guy who plays Searle is the spitting image of Kirendip, who works in my office. FACT. 4. The movie credits reveal the presence of a so-called ‘Science Advisor’. I suspect that this role isn’t a serious position, but more of an attempt to lend some credibility to one of the most wildly ludicrous plots ever committed to celluloid. I’m not saying that wildly ludicrous is necessarily bad – and Sunshine is a decent, beautiful-looking film – but there’s really no need to dress it up in some crazy cloak of plausibility. It just doesn’t fit; the key part of the phrase ‘science fiction’ is the second, not the first. 5. If you’re flying through space, and a member of your crew is the subject of a suicide watch, it’s probably best not to leave them unattended in a room full of scalpels. In summary, I quite like being invited to sample free stuff I’m not required to write about. So if anyone wants to book me gratis flights to Spain and a table at el Bulli, I’m all ears. 1. Because, like Everest, it’s there. 2. Because I’m an adventurous eater. Dog? Done it. Seahorse? Delicious. Locusts? Bring ’em on. 3. Because my old friend Hugh Fearnley Whittingstall says I should, revealing in his wondrous Bible of Meat™ that his own experiments with the dish have been “a resounding success” (page 199). And, as regular readers will know, when Hugh says ‘jump’, I generally grab my trusty chef’s blade and start chopping chunks of flesh. 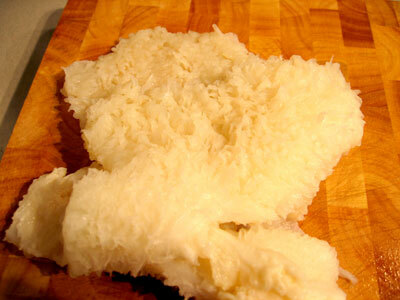 Tripe, in it’s naked form (above) is not an attractive prospect. It has the look and feel of a sodden bath mat, whilst it gives off the damp and musty odour of a basset hound that’s just just come in from the rain; one can understand why it doesn’t sit comfortably next to the racks of lamb and beef medallions at your local Waitrose. 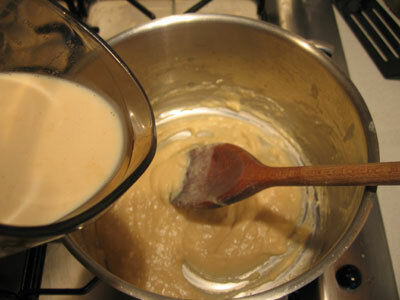 Turning the thing into something resembling edible food is going to be a challenge, and I choose the classic Lancashire recipe – tripe and onions – because it seems such an arbitrary mix of ingredients: cooked in milk and flavoured with nutmeg. Why that combination? Why not marry the innards to carrot, boil them in gin and add a dusting of turmeric? Or mix with asparagus, roast in peanut sauce then lightly sprinkle with licorice shavings? I don’t know the answer, and I’m not going to argue with tradition. 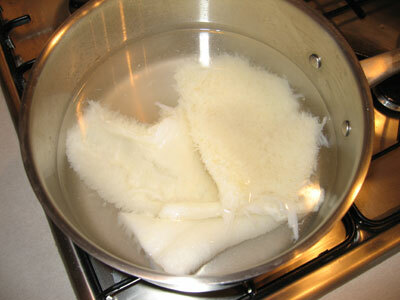 So we start by parboiling the tripe. 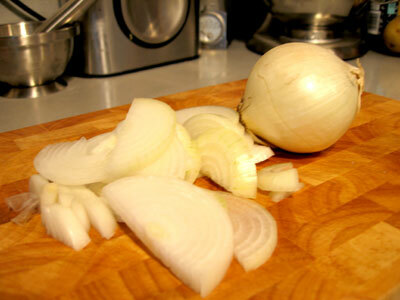 While the tripe is receiving its watery baptism I cut up a couple of white Italian onions, the theory being that this will preserve the pale nature of the dish – if you’re going to cook white stuff, I reason, then why not do it properly? 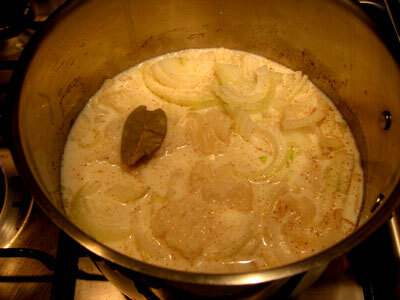 The tripe is removed from the water and cut into pieces, and then it’s back into the pan, where it nestles comfortably amongst the onions, doused in a pint of milk and seasoned with a healthy pinch of nutmeg and a bay leaf. And next? We simmer the ingredients for a couple of hours. What you do during this time is up to you, but in case you\’re short of ideas, this is what I got up to: I took some rubbish down to the basement, put up a couple of Zero Gravity shelves in the bedroom, watered my collection of chives, read chapter six of The Last Amateurs: Playing for Glory and Honor in Division 1 Basketball by the great American sportswriter John Feinstein, and made some mashed potato. What a life, eh? 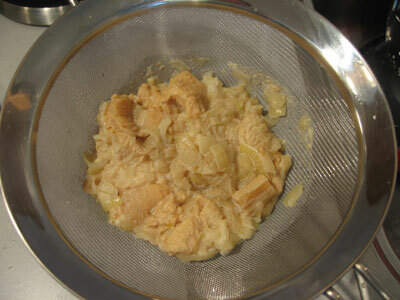 Then I strain the tripe, making sure to preserve the cooking liquid. Suddenly, it’s looking more like food although, to be fair, it’s not terribly attractive yet, taking on the appearance of a faded orange porridge. Meanwhile, back in the pan, I melt some butter, stir in a few tablespoons of flour and cook gently for a minute or so, stirring continuously. Then it’s off the heat, and in with the reserved cooking liquid, before returning to the stove and back to the boil, all the time stirring, until the sauce is nicely thickened. Finally, the tripe and onions go back in, and the whole shebang is reheated, plated next to the mash, and garnished with parsley. To be quite frank, it’s disgusting. It has the texture of mucus. Or glue. And it tastes like decomposing leek. I invite my neighbour to sample a mouthful, but he describes it as the worst thing he’s ever eaten. And strangely, I think this is how it’s meant to taste. The recipe is a ‘classic’, and I’m confident enough in my own abilities in the kitchen to know when I’ve screwed up a recipe – and I haven’t in this case. I suspect that that tripe has dropped out of fashion for a a very good reason: that in reality, no-one likes the bloody stuff, not even your Gran. And while I’m all for the waste-nothing, nose-to-nail approach to meat eating, this is a step too far, like making a pie out of hair or some eyelid soup: just because you can doesn’t mean you should. 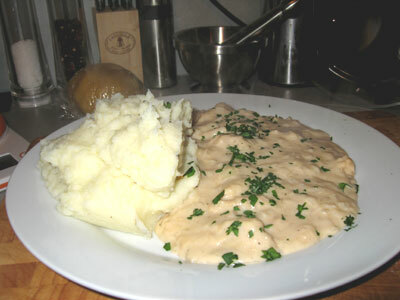 The mashed potato was really yummy, however. Today I received a call from Paul. It appears as though my last entry had created quite a stir at the bakery and, in between rustling up batches of baguettes and piles of petits fours, it was decided that action needed to be taken. This is obviously very exciting news, and I hope to be able to bring you pictures of this landmark event. Perhaps I’ll even take along one of my own loaves for expert appraisal, maybe my celebrated (by me, as no-one else has tried it) pain à l’ancienne. I retard the dough in the fridge overnight, dontcha know. * Cadbury Schweppes, please take note.